Acoustic beam-forming arrays, commonly known as acoustic cameras, enable the user to visualize different sound sources at different frequencies and source strengths. The resolution and ability to resolve sound sources spaced closely apart, and at lower frequencies, is mainly decided by overall size and number of microphones of the equipment being used. Although image manipulation and deconvolution techniques on the beam-formed results might give added resolution, in practice the properties of the array still influence the results. This size versus resolution criteria is the crux of the acoustic camera market. 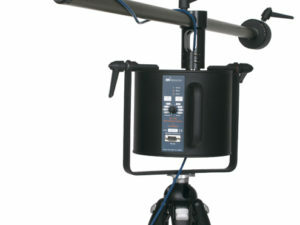 Users want something that is small, light weight, and portable, while at the same time having excellent resolution, and the ability to go low in frequency. This has been an impossible demand for a single system – until now. 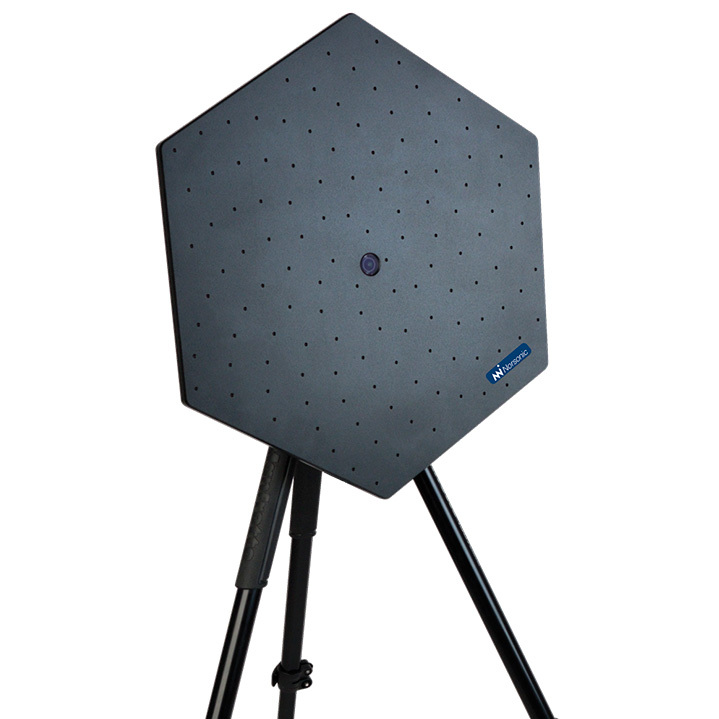 The Norsonic Hextile is a module based approach to acoustic camera that gives the user both portability and great resolution for a wide range of measurement situations. 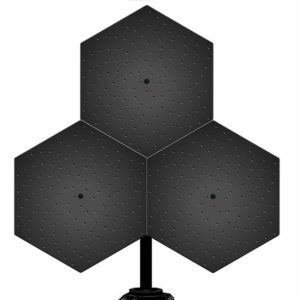 The array dish is based on a hexagon shape, given it both its name, and the ability to combine several tiles into larger systems. 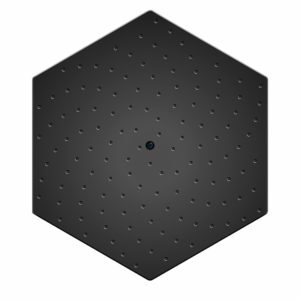 With a single Hextile, the user has a small, portable and lightweight acoustic camera that can be used for a wide range of measurement situations. The Hextile is a USB based acoustic camera, with a single USB cable for both power and data transfer – no extra battery cable needed. 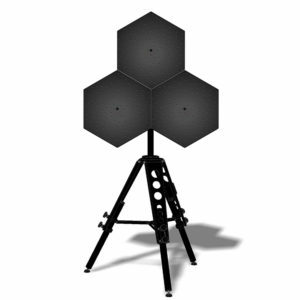 The array is made from robust and lightweight aluminium, has 128 MEMS microphones, and is less than 3 kg in weight while having a maximum diameter of 46 cm. 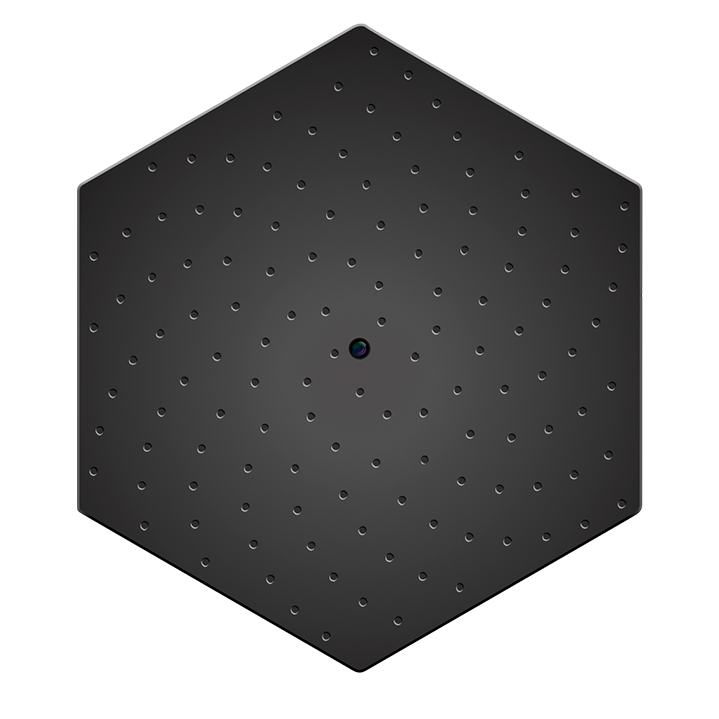 The low frequency limit for the Hextile is 410 Hz. 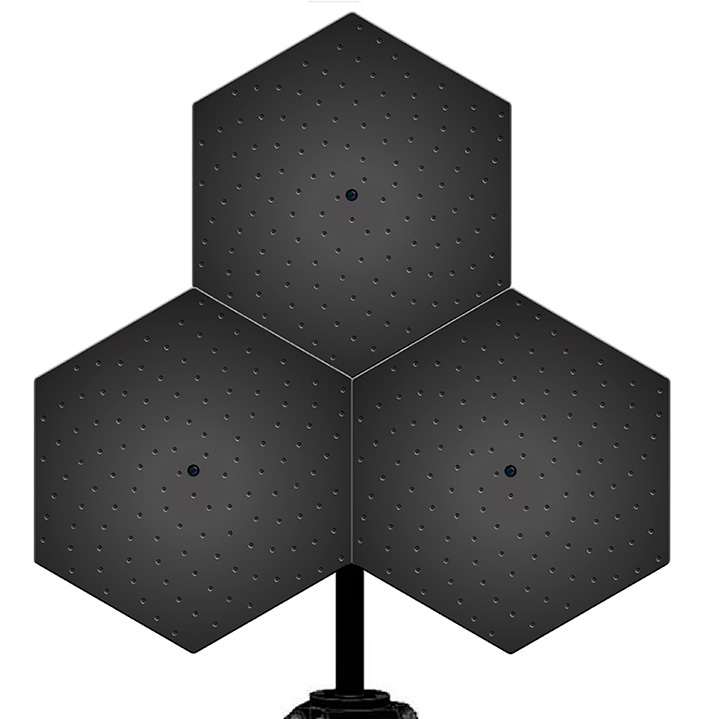 For users that require better resolution both in lower frequencies and overall, three single Hextiles can be combined to a larger Multitile system, consisting of 384 microphones with a maximum diameter of 96 cm. The low frequency limit for the Multitile is 220 Hz. For special low frequency applications below 1 kHz, it is also possible to utilise the Multitile in the low frequency configuration as the Multitile (LF mode). By placing the individual Hextiles further away, the maximum diameter of the complete array system is increased to 1.46 m, making it ideal for low frequency measurements. The Multitile (LF mode) is for low frequency measurements below 1 kHz, with a lowest frequency limit of 120 Hz. As all parts are integrated in the camera’s frontend disc, there is no need for an additional signal processing interface box. The system is ready for use after powering the unit from mains or an external battery and connecting the LAN cable to the computer. 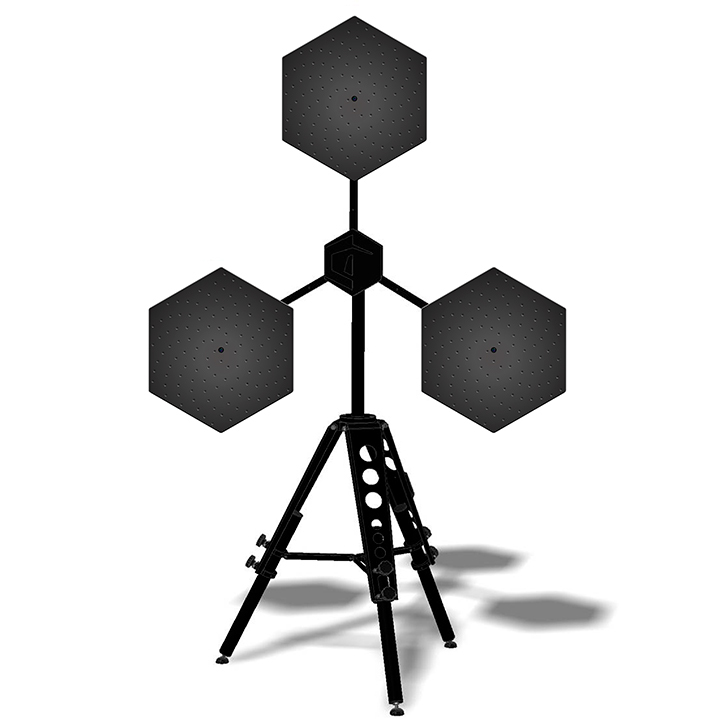 Three camera frontends are available: a 0.4m array with 128 microphones, a 1 meter array holding 256 microphones and a 1.6 meter array with 384 microphones. The difference in the size and number of microphones resides in the mapping frequency range of each system. Please refer to the data sheet for more information. The Nor848A software is extremely intuitive and easy to use. 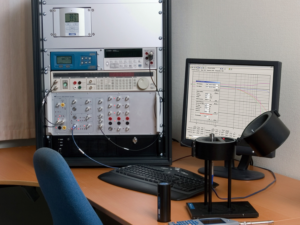 The user is able to operate the system and make measurements using the software’s single measurement interface. 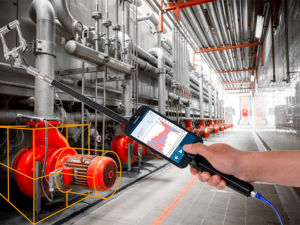 Analysis can be made in real-time while in the field or for post-analyzed with a finer resolution by recording the sound signal from every microphone as well as the video from the integrated optical camera. Octave Band (1/1), one-third Octave Band (1/3) and FFT analysis is supported.